This is one of my favorite foods to eat when I’m trying to pack in a lot of vegetables into a meal. If you’re cutting down on the carbs, you can serve it as is. Our family likes to eat it over a bed of cooked rice. First, get everything chopped up. Then I get the chicken going. Grab a frying pan, put it on the stove and turn to medium-high, and add vegetable oil and chicken. Sprinkle with garlic salt and pepper. Once the chicken is starting to brown a bit, add the water. Stir occasionally until it is cooked through. Usually 7-10 minutes. As soon as I get the chicken started, I start on the veggies. In a larger pan heat it up to medium-high, throw in your vegetable oil, and veggies. Sprinkle with garlic salt and pepper. Same as the chicken, once the veggies start to brown just a bit, add in your water. Stirring occasionally. Cook until the veggies are fork tender. While your pans are going, mix up your sauce in a little bowl, soy sauce, cold water, corn starch, ginger, and honey. Whisk until everything is blended with no lumps. 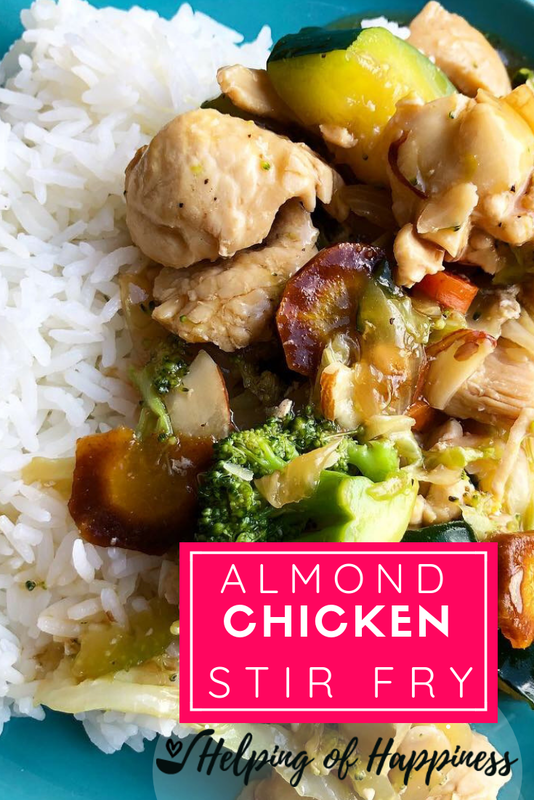 Dump your chicken into the veggie pot, add the almonds and the sauce and stir around quickly as the sauce thickens- just a minute or two. For a print friendly version, click here.